BURLINGTON, Ont. – The control cabinet-free IndraDrive Mi drive system from Rexroth allows for the realization of a completely independent drive solution. The supply unit that can be directly integrated into the machine makes this possible. The Rexroth IndraDrive Mi is directly installed on the machine. 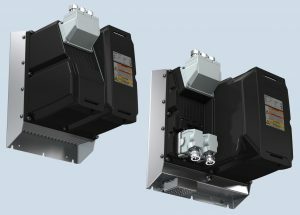 Rexroth has now equipped these mains and supply modules with additional cooling options. Convection cooling and forced air cooling options are now also available in addition to the thermal interface for cold plate mounting or insulated mounting. These two types of cooling do not require any process water for cooling and allow for flexible use in a wide range of production environments. Applications for which no process water is available, such as in conveying or handling technology. All mains connection components that were previously placed in the control cabinet are now realized in IP65 in the IndraDrive Mi and can be directly installed in the machine. The mains filter, mains choke and mains contactor are integrated in the KNK03 mains module to supply direct power from the grid. The regenerative KMV03 power supply module with control electronics, braking resistor and brake transistor has completely replaced the power supply and the control electronics in the control cabinet. Please visit www.BoschRexroth.ca for more information.